The work delivered through open access Children's Centres, Youth Hubs and other settings is critical to achieving positive outcomes for children, young people and their families, and incorporates a range of key services. A key benefit of integrating Children's Centres and Youth Work in the same service is that we can identify and build synergies between them as they work together more closely to provide open access services. Targeted work in open access settings ensures greater prevention as early as possible to ensure well-being for all. It is also essential as part of the support package for the cases stepped down from Specialist Children's Services and to ensure improvements are maintained without the necessity for long term casework. Children's Centres provide a core offer of services to improve outcomes for young children and their families, with a particular focus on those in greatest need. They work to make sure all children are properly prepared for school, regardless of background or family circumstances. They also offer support to parents. Public Health is a critical partner for Children's Centres. The effectiveness of leadership, governance and management. 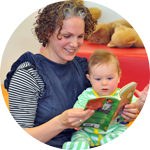 The latest information and updates on Children's Centres within your area.